As I tweeted out this morning, we think that today is the last day to vote for Amanda's classic Northrop Grumman Lunar Lander X CHALLENGE photo in that photo contest being run by GOOD Magazine (full voting instructions here). As of right now, Amanda's shot seems to be winning! We'll keep our fingers crossed. For those that care, this is the launch of a Bumper 2, a 2 stage rocket based on the German V-2 that was captured during WWII. It was the first rocket launched from Cape Canaveral. 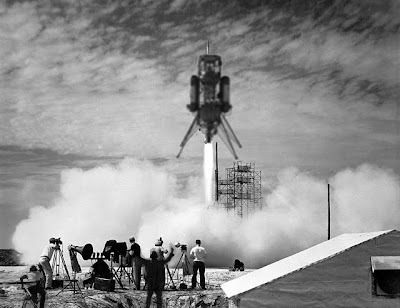 The original description from APOD: A new chapter in space flight began on 1950 July with the launch of the first rocket from Cape Canaveral, Florida: the Bumper V-2. Shown above, the Bumper V-2 was an ambitious two-stage rocket program that topped a V-2 missile base with a WAC Corporal rocket. The upper stage was able to reach then-record altitudes of almost 400 kilometers, higher than even modern Space Shuttles fly today. 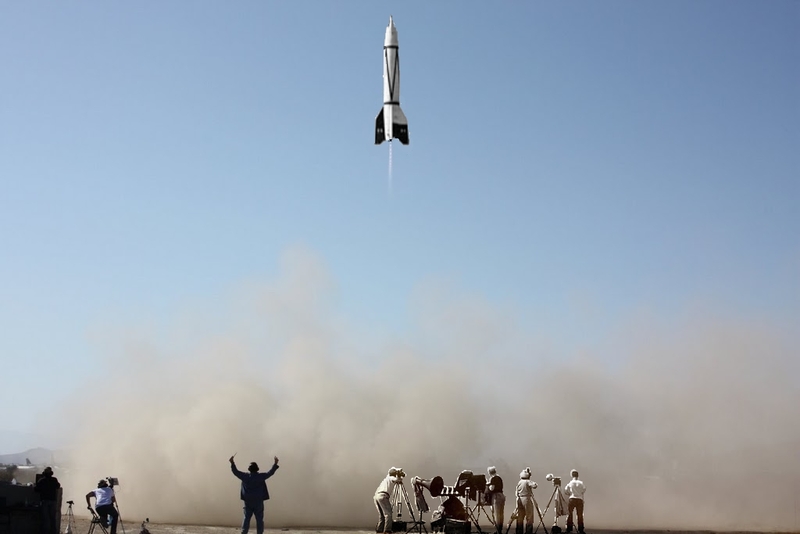 Launched under the direction of the General Electric Company, the Bumper V-2 was used primarily for testing rocket systems and for research on the upper atmosphere. Bumper V-2 rockets carried small payloads that allowed them to measure attributes including air temperature and cosmic ray impacts. Seven years later, the Soviet Union launched Sputnik I and Sputnik II, the first satellites into Earth orbit. In response in 1958, 50 years ago today, the US created NASA. So, I had to fire up the old PhotoShop (actually, I fired up the old Paint.NET on my work computer--I've only got PhotoShop at home) and made a few images of my own. Let me know what you think!